In this article we are going to build a sample system consisting of a Delphi DataSnap REST server application and jQuery Mobile web client. We are going to use Delphi XE2 and jQueryMobile 1.0.1, which is the latest versions available at the time of writing this article (January 2012). Embarcadero DataSnap is an enterprise framework; very much like JEE, CORBA, SOAP and similar client/server, distributes, multitier architectures. 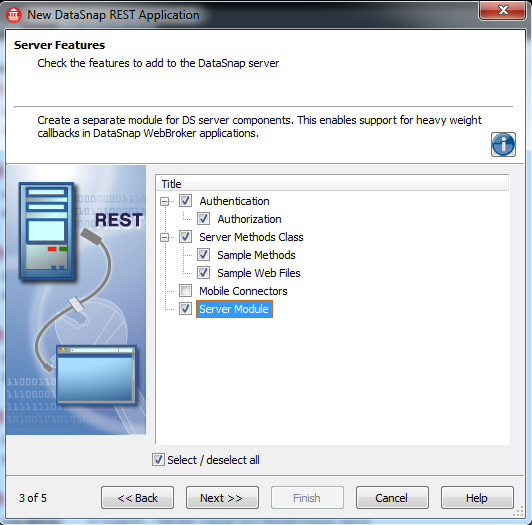 DataSnap is a feature of enterprise and higher versions of Embarcadero Delphi, C++Builder and RAD Studio. With DataSnap it is possible to build scalable, fault-tolerant, multitier systems with native, compiled server application and wide variety of native, managed and web clients communicating with server using different communication protocols. Start Delphi XE2. Click on the “File/New/Other…” menu item. 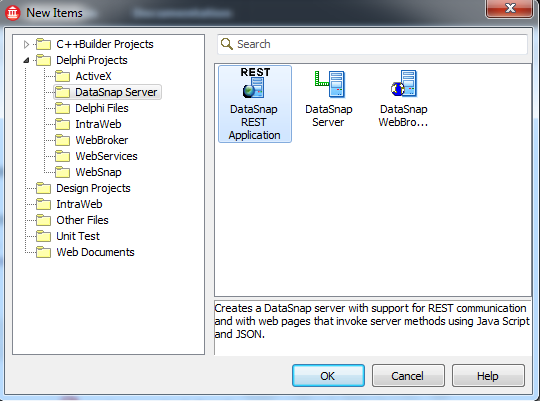 Inside the “New Items” dialog go to “Delphi Projects/DataSnap Server” category and “DataSnap REST Application” icon. Click on OK. 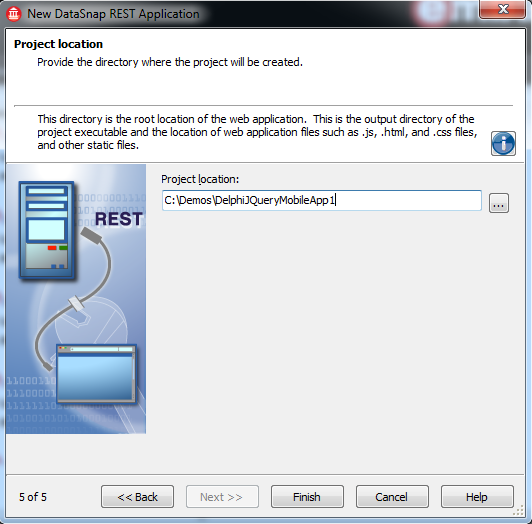 In the first step of the “New DataSnap REST Application” wizard we need to decide how our web application must be implemented: as a standalone VCL/Console-based web server application that is a self-contained Windows executable containings both a web server and a web application, or as a DLL to be deployed to an ISAPI combatible web server. We are going to go for the first, default option which is a standalone WebBroker application. In the second step of the wizard we need to decide which HTTP port number we want to use and if we want to support the HTTPS. We are going to leave the default port “8080” and leave “HTTPS” option unchecked. It is always a good idea to click on a “Test Port” button to verify that it is not already in use on your machine. Click “OK” and “Next”. The third screen of the wizard is for choosing server features. Keep the features selected by default and also select “Server Module” feature. On the following wizard screen we can choose the base class for our server methods class. If you keep the default option of inheriting directly from “TComponent” you cannot really use the non-visual components like data base connections, queries or datasets. 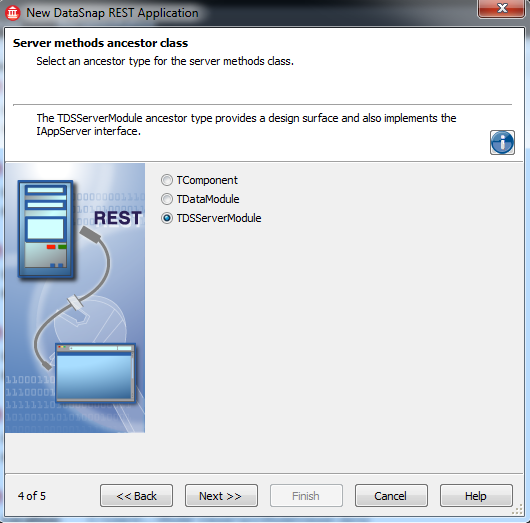 Select “TDSServerModule” to inherit also the implementation of IAppServer interface on the server for DataSnap TClientDataSet-based clients. The last screen is the projection location. The last part of the name will be used as both a new folder and also the actual project name. You can put this project anywhere. 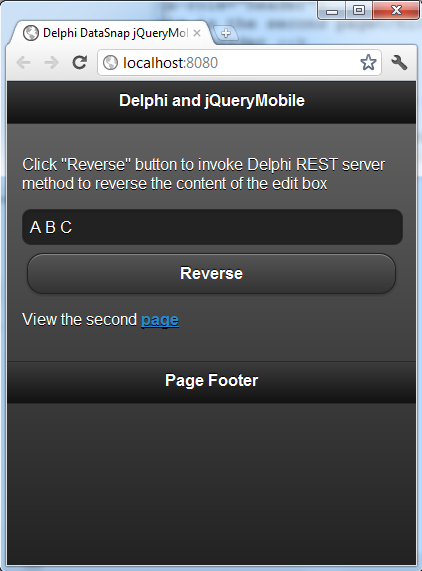 Enter “C:\Demos\DelphiJQueryMobileApp1” and click finish button. Select “Save All” and keep all default names for different units in the project. Run the project now. 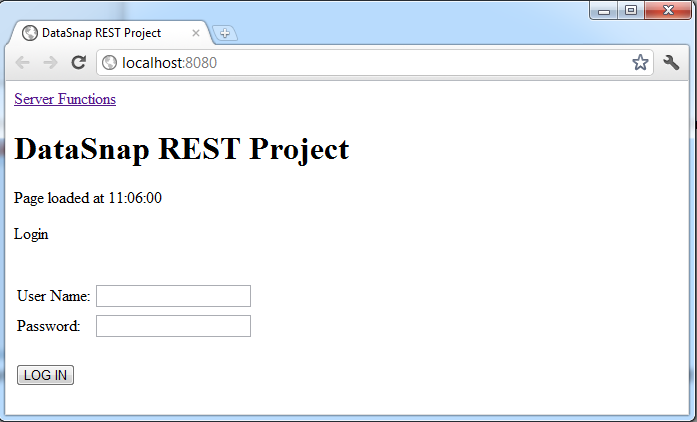 It will first display the main form of the VCL Forms application that acts as a standalone web server and listens on a specified port. Click on “Open Browser” button to start the web application and open it in the default web browser. I’m using Chrome, but it might be a different default web browser, like Internet Explorer or Firefox. We have selected “Authentication” and “Authorization” options in the wizard. This is the reason that we are presented with username and password text boxes. Currently there is no username or password check implemented, so we can just press on the “LOG IN” button to hide login controls and display “Reverse String” text box and button. Click on the button and notice that the contents of the edit box has been reversed and that the “page loaded at” information does not change. 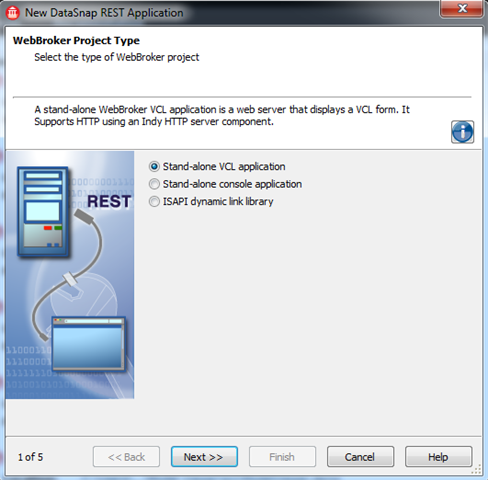 We can verify that clicking on the button in the web browser calls server side functionality implemented in native Delphi code by placing a breakpoint inside the “ReverseString” method and re-running the web application with debugging. Close the web browser and close the web server application. Open “ServerMethodsUnit1” unit and click in the gutter just in the line 30, where the reverse string functionality is implemented. Now press F9 or just click on the green arrow “run” button with a little red-black bug on it to run the application with debugging. Open the browser window and click on the “LOG IN” button. When you click on “Reverse String” button you should see that your breakpoint stopped the execution of the program. Click on “Run” button again to resume the program. 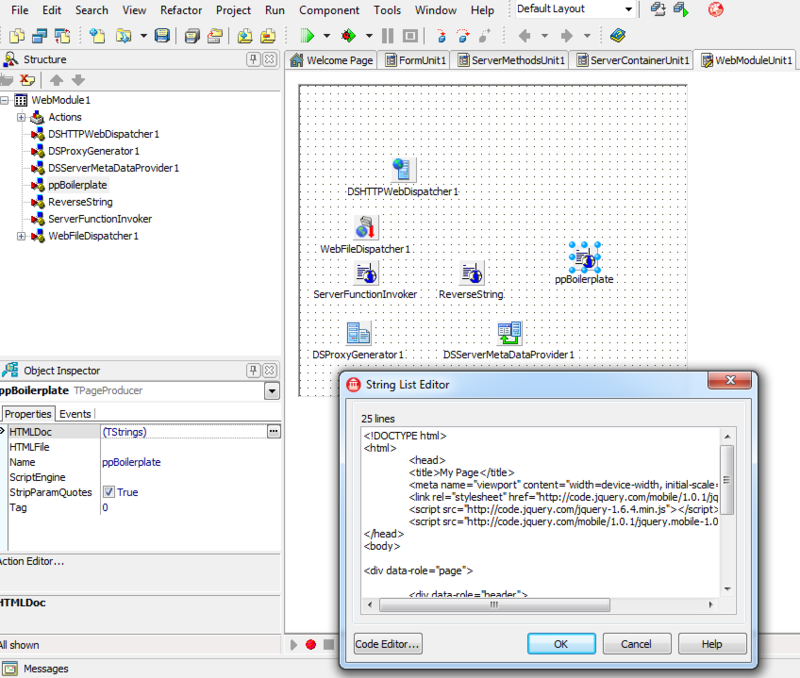 The ability to debug our server-side Delphi logic is very powerful. You can implement your application server and data access logic in powerful Delphi code and you can use HTML5, CSS3 and jQuery to implement the client side user interface and server access logic. You can download the jQueryMobile from http://jquerymobile.com/. At the time of this writing the latest version of jQueryMobile is 1.0.1. 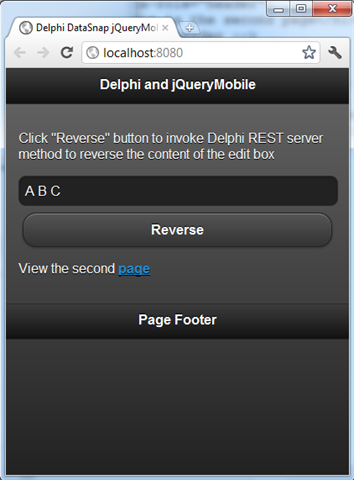 The goal of this article is to create a standard, boliler-plate “Delphi REST Application” with a simple jQueryMobile-enabled web client. To keep this article simple, I’m not going to modify the server implementation, and will provide a very simple jQueryMobile web page that is going to use the server side functionality – our “Echo” and “ReverseString” test methods generated by the wizard. Before doing any changes to the web application that was generated by the wizard, let’s have a look how the client side logic is currently implemented. If we check the implementation of this method inside the “WebModuleUni1” file, we can see for example that “serverfunctionjs” transparent tag is replaced in code with “js/serverfunctions.js”. There are also other tags that are being replaced. In the first line of code we assign the contents of the input element with a class “valueField” attached to it. The contents of this input control will be sent to the server side method as a parameter to “ReverseString” server method call. The transparent tag “classname” is resolved before this call happens with the actual name of a server methods class using a call to “ServerMethodsUnit1.TServerMethods1.ClassName”, which is in our case “TServerMethods1” string. This class looks like this. I have stripped out calls to “EchoString” for readability. It is important to notice that the “TServerMethods1” constructor expects as a parameter a “connectionInfo” object that is later passed to “ServerFunctionExecutor” constructor. The “connectionInfo” variable is defined in the “connection.js” source file and it is initialized in the web page “onLoad()” event with the call to “setConnection” method. 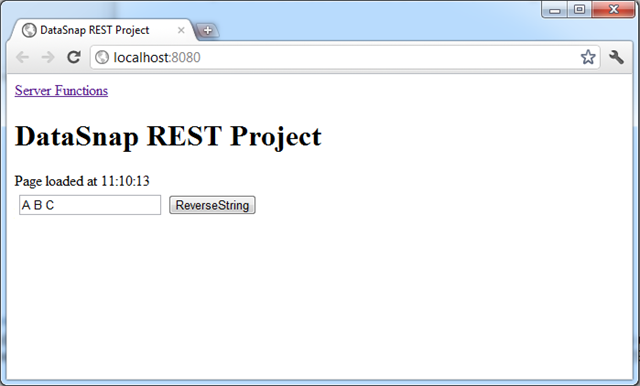 Transparent tags “host”, “port” and “urlpath” are replaced before this html page is dispatched with the actual server-side values from in the Delphi server code from the “Request” object that encapsulates current HTTP request. Notice that the “button” tag has a “onReverseStringClick()” event handler assigned to its “onclick” event. Now that we understand what’s going on in this code, we can start with implementing our own, jQueryMobile-enabled, version of this page. 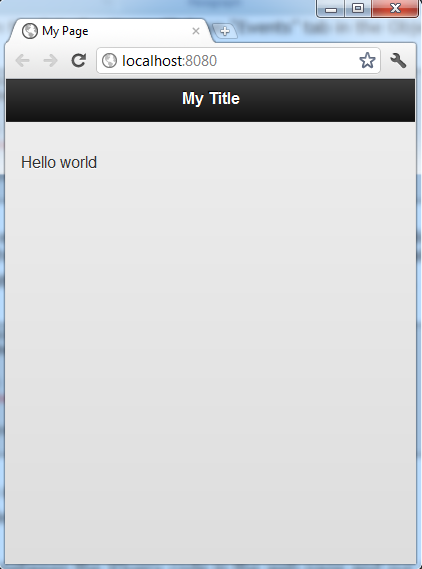 The jQueryMobile documentation comes with an example of a “boilerplate” page that represents a “hello world” starting point for any other, more complex page. In this step I’m going to add to the main web module of our Delphi REST application an additional “TPageProducer” component that is going to be responsible for generating the contents of a jQueryMobile boilerplate code. Open “WebModuleUnit1” unit and drop a new instance of “TPageProducer” component to the main web module of our application. Rename it to “ppBoilerplate”. Open the “HTMLDoc” property of the “ppBoilerplate” component and paste the HTML boilerplate markup into the editor. Click OK. This is the alternative way of providing the page markup. You can either use “HTMLFile” property to point to a physical HTML file, like the two other producer components, or directly enter the markup into the HTMLDoc property, so it is stored inside the DFM file and there is no need for an actual HTML file. This two properties are mutually exclusive, so setting one, automatically clears the other. If we run the application now, we can see that it still displays the “ReverseString” page and not the contents from our new page producer. We need to change the default page producer for our application, so the our jQueryMobile boilerplate markup is served to a browser. In order to do this we need to change the implementation of the web module default action handler. 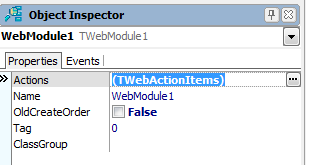 Click somewhere on the surface of the “WebModule1” to make sure that it is selected in the Object Inspector. 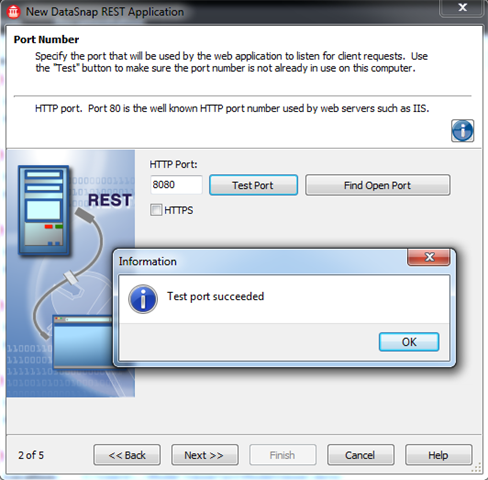 We can see from this code that for every HTTP request arriving to our Delphi web application, the contents of the “ReverseString” page producer component is assigned to the “Content” property of the “Response” object that encapsulates the HTTP response that is eventually going to be sent to the web browser. Let’s just replace “ReverseString” with the name of our page producer “ppBoilerplate”. Click on “Save All” and run the web application. Now we should see the jQueryMobile 1.0.1 boilerplate page in the web browser. 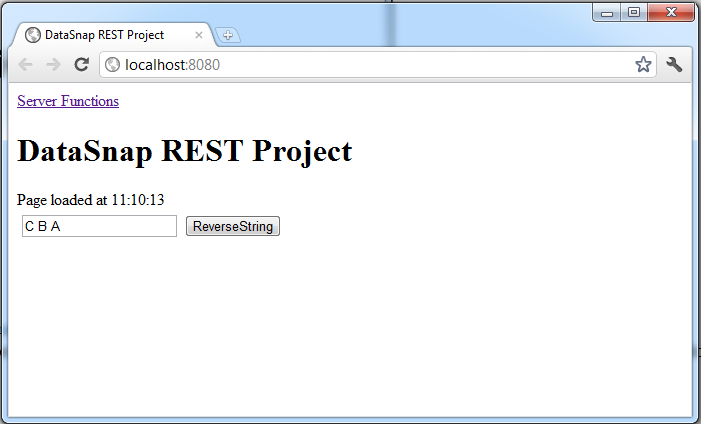 The next step is to add interactions between the jQuery code in the web page and our Delphi server methods. Now we are going to enhance our boilerplate jQueryMobile web page and add to it a possibility to call server-side functions implemented in Delphi code. That would only require modifying the value of the “HTMLDoc” property. You can conventiently open this property in the code editor clicking on the “Code Editor…” button in the bottom left corner of the string list editor. Save all and run the application. Depending on your browser you should see a page that contains a “Reverse String” button. There is also a link that makes it possible to jump to the second page with “echoing” functionality. That’s it. 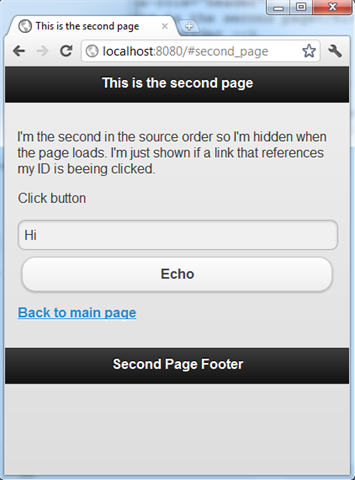 The source code for this template application can be downloaded from Embarcadero Code Central. You can optionally remove from this boilerplate applications all the unused code, but that’s something I’m leaving to the reader. In this article we have seen how to start building enterprise, multitier systems using Embarcadero Delphi XE2 and jQueryMobile. RAD Studio XE2 includes many interesting and powerful features like 64-bit native Delphi compilation and the new FireMonkey framework for building great looking native application on multiple operating systems. The DataSnap framework is often overlooked by Delphi and C++Builder developers. The DataSnap architecture is the perfect choice for building server-side applications for any clients. Currently there are two main kinds of client applications that can work with DataSnap servers: native applications and web applications.